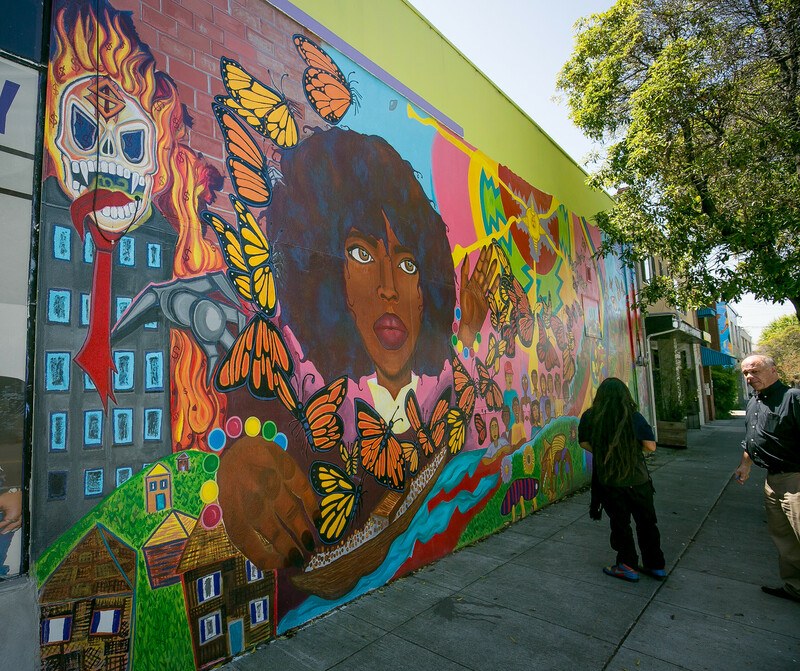 Angel Jesus Perez is a young Berkeley mural champion. He is the senior artist and print tech for Youth Spirits Art Works. His prints are amazing. 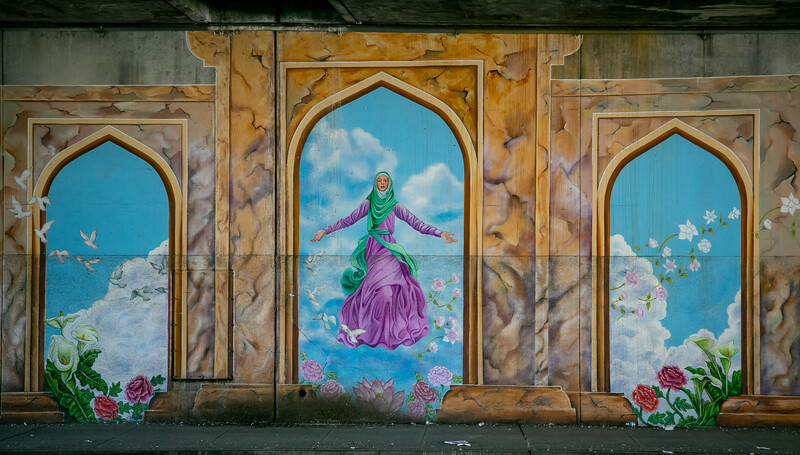 His murals soar. His dedication to community and youth and at-risk youth and poor youth and homeless youth inspires. 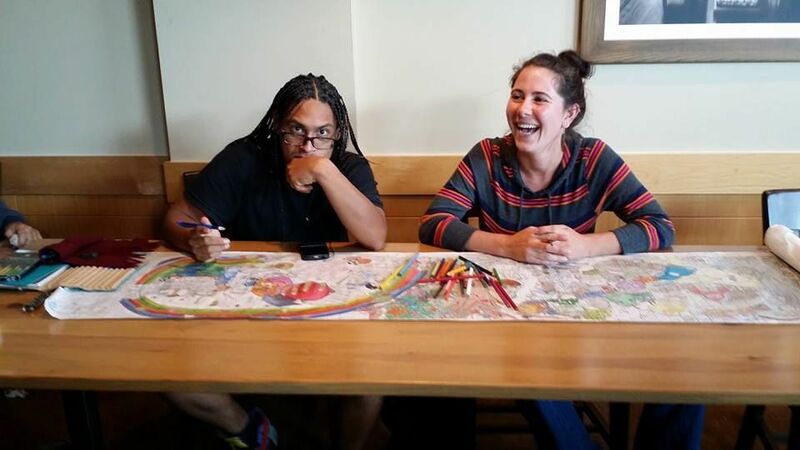 He is a cultural warrior, an artist, a teacher, a community organizer. He is a inspiration – truly. His optimism and dedication and craft – oh my. I met him in late 2016 when he was working on the “Displacement of Beauty and Migration of Gentrification” mural along Alcatraz just east of the YSA office. 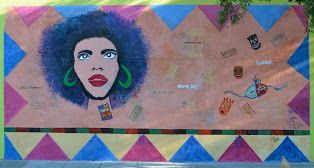 The mural started as a hair-themed mural in keeping with the hair/beauty business on the corner of Adeline and Alcatraz. Neighbors were alarmed when he primed the wall, afraid that he intended to paint over the woman. He didn’t. 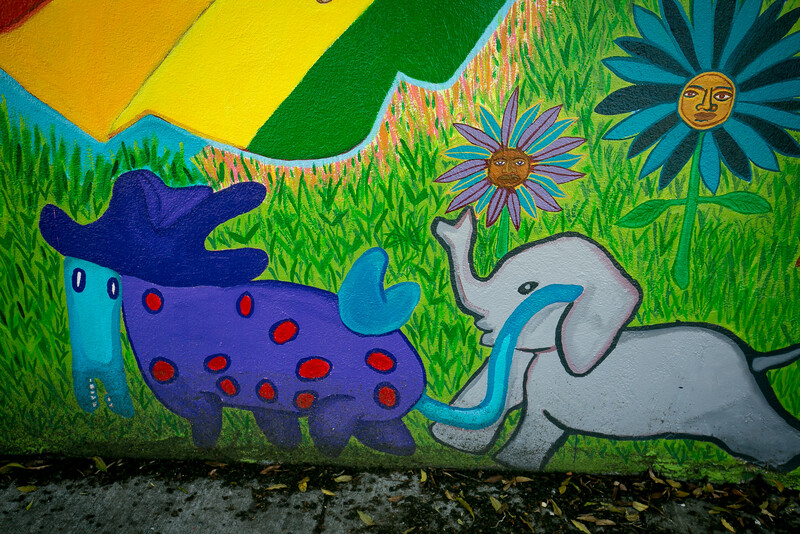 He incorporated her into the mural. It was a group project, a teaching and learning experience. 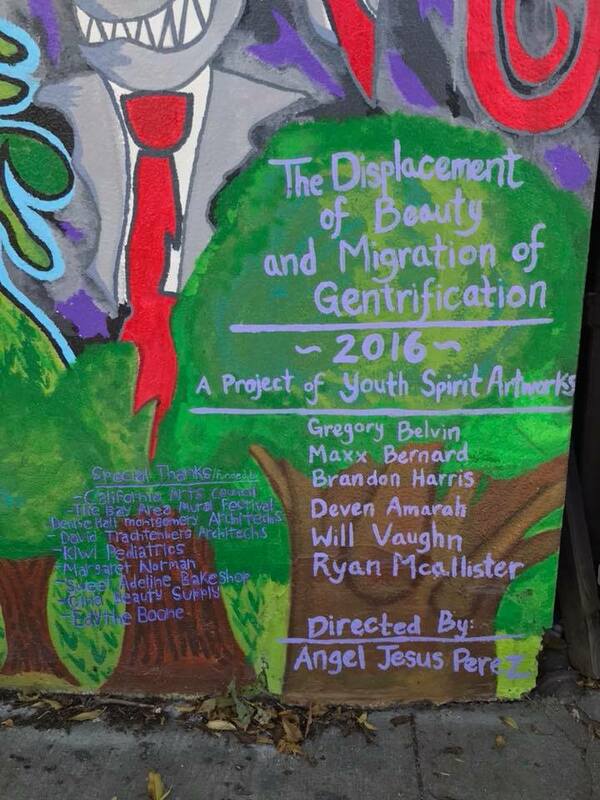 The mural was part of the 2016 Bay Area Mural Festival, the theme of which was gentrification. 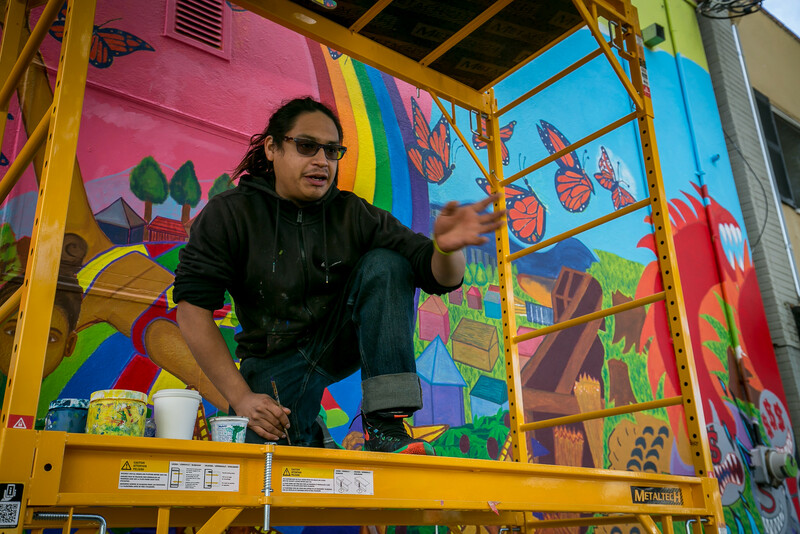 Perez worked with a crew of kids who were the face of young Berkeley – some divergent, some trans, some mixed-race, and some afraid of heights, a challenge with a project involving scaffolding. 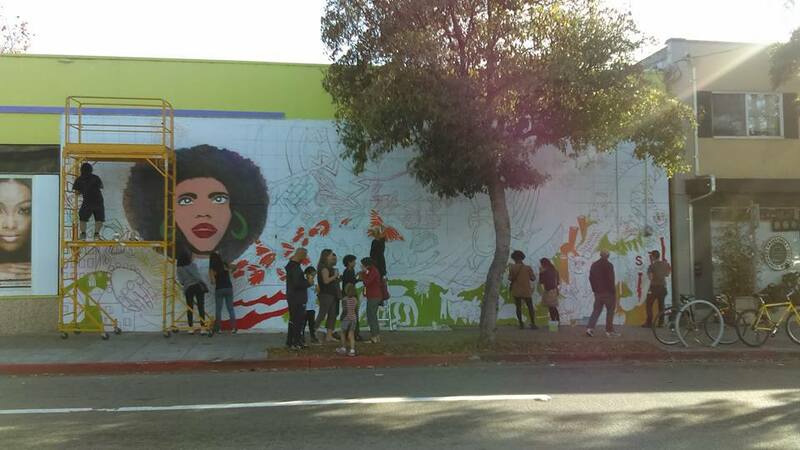 One had worked on the original woman-hair mural where she urged a darker skin tone. I know the term “Young Turk” and have used it all my life, never knowing that “Young Turks” was an actual Turkish nationalist party made up of Ottoman exiles, students, civil servants, and army officers who supported a constitutional government over the absolute monarchy of the Ottoman Empire. 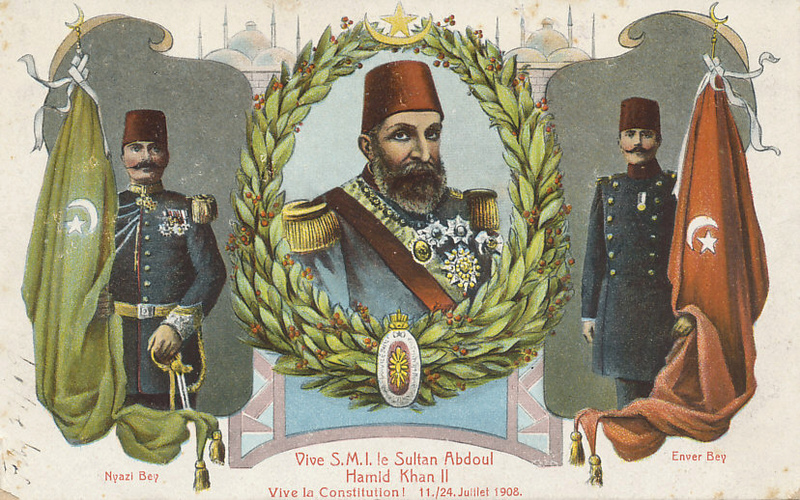 Later, their leaders led a rebellion against the absolute rule of Sultan Abdul Hamid II in the 1908 Young Turk Revolution. Who knew? 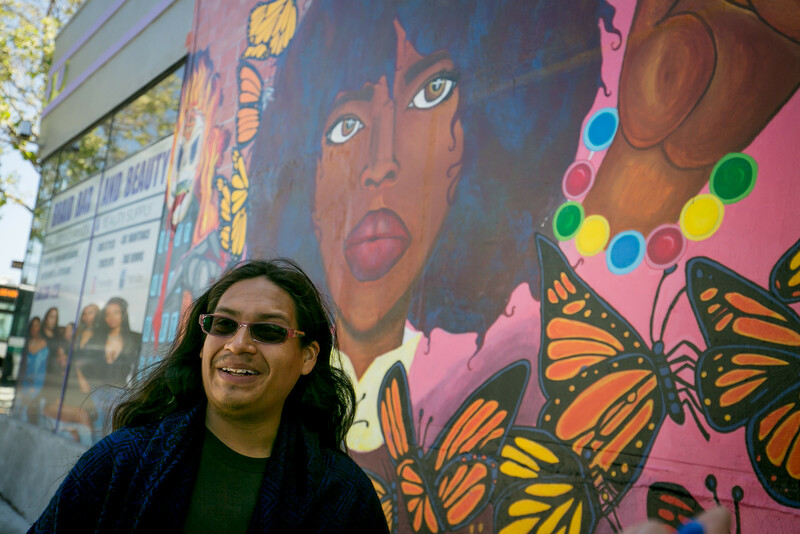 The point being – Angel Perez is something of a Young Turk in the Bay Area muralist world – but he is oh-so-much-more than that. 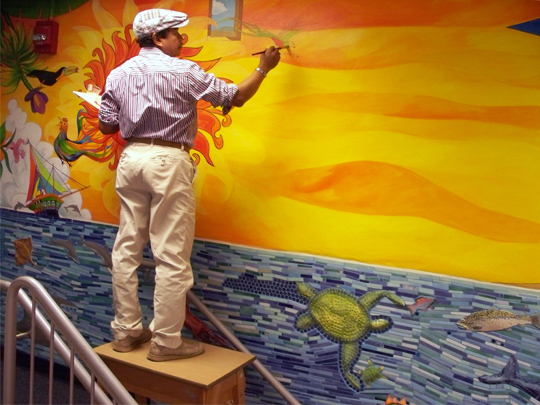 He has an open and obvious respect for the senior figures of the muralist movement, and he sees painting murals as a therapeutic and healthy activity for poor kids. He is a warrior and an organizer and a teacher. I’ve seen him greet neighborhood elders with a degree of respect that can’t be faked or pretended or learned – he just knows it. He is really something. Who is this phenomenal young man? 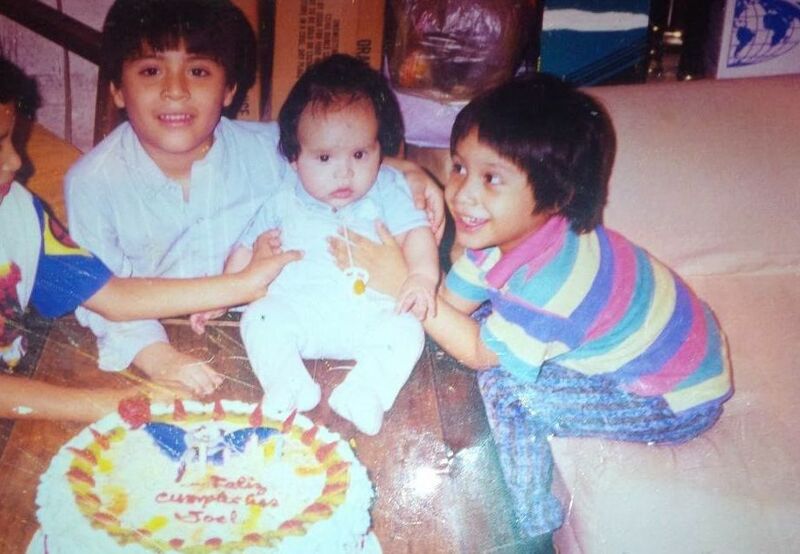 Perez was born in 1993 in Washington D.C. to parents who were born in Mexico. His father is from Temastian, Jalisco, Mexico. He came to the United States through Tijuana in 1986. He worked in the fields for four years but found California too slow and wanted city life. He moved to Washington D.C. in 1990. 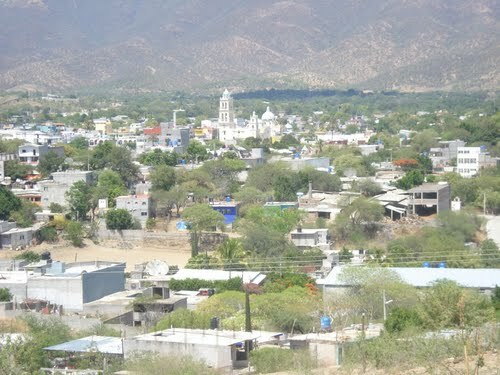 His mother was born in San Bernardo, Puebla, Mexico. She came to Washington D.C. in 1989. Perez is on the right in this photograph. 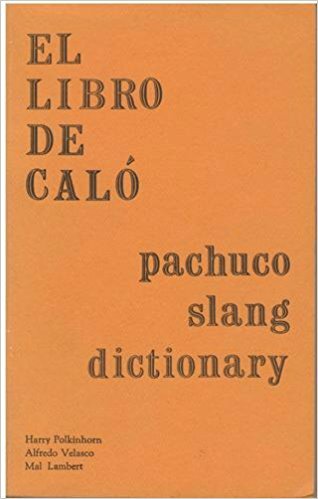 Spanish was the language at home. The kids were bilingual, and as is the case in many immigrant families they translated for their parents. 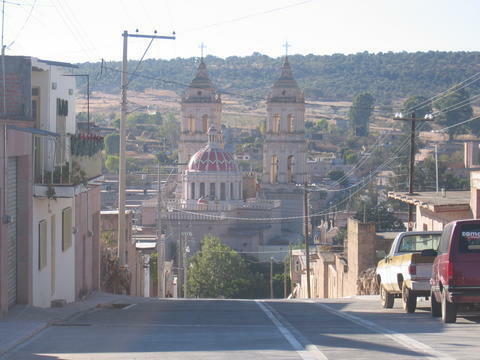 Their neighborhood was diverse – Mexicans, Salvadorans, Puerto Ricans, and Ethiopians. 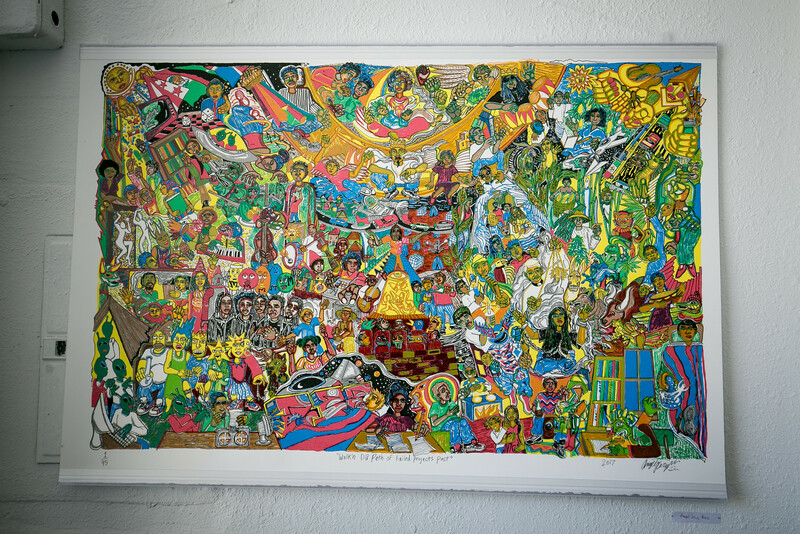 As a boy, Perez idolized Jorge Luis Somarriba, a Nicaraguan artist and muralist. Perez spoke with him three times, hoping to draw all the knowledge and wisdom that he could from him. Somarriba gave the young Perez a sketch book. It meant a lot. Perez found solace in art. 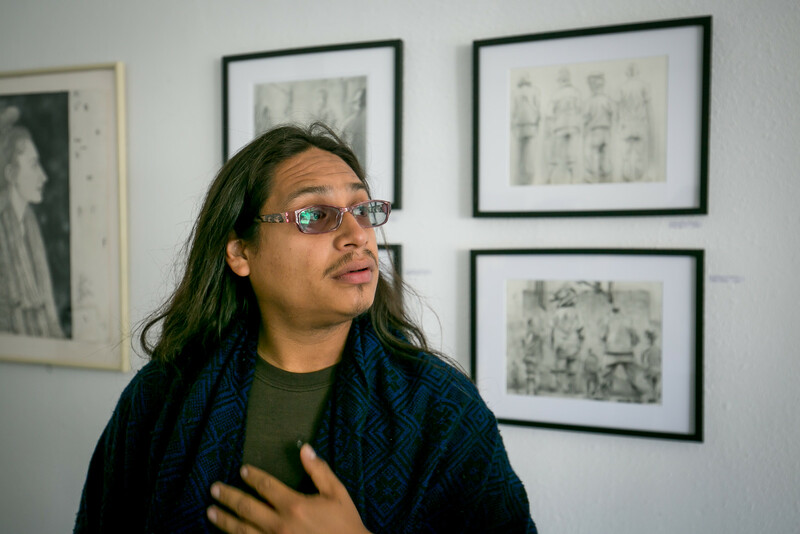 From sixth grade through high school he took part in an after-school art program at the Sitar Art Center, where he was also exposed to violin and percussion. 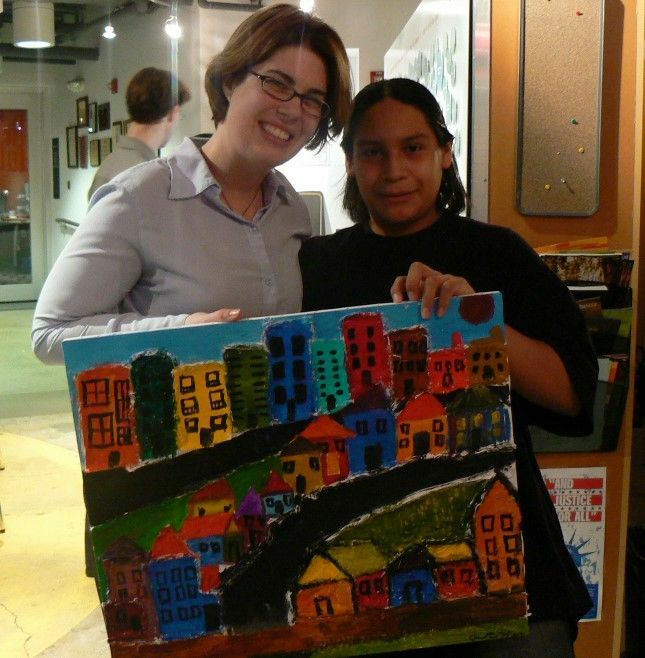 Here he holds a painting he made, standing with his teacher Sara Pluto-Gibson. It was one of his first sold pieces. He went to high school at the Duke Ellington School of the Arts. Most of the students were African-American and all were very gifted. There was an emphasis on music. His great love was graphics, and here he got his first exposure to printmaking. He assembled a portfolio and on the basis of his work was admitted to the California College of Art starting in the fall of 2011. He flew to Los Angeles and stayed with his uncle in Santa Ana. 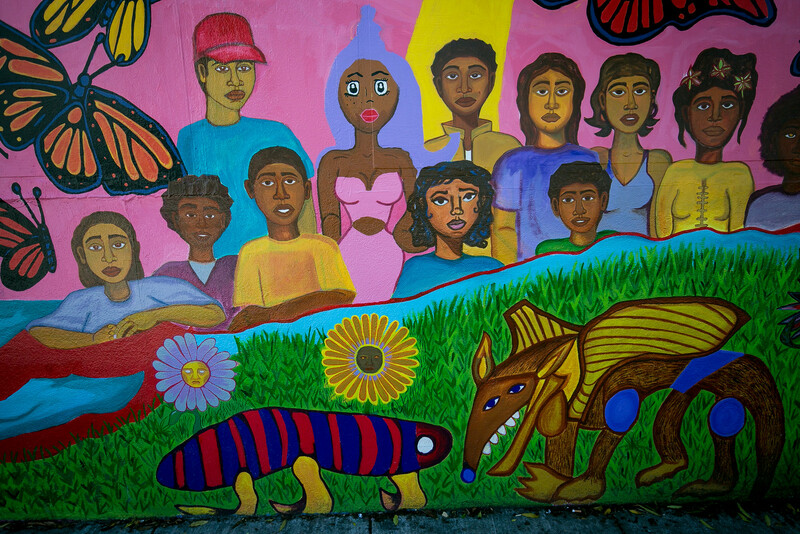 For the first time he was exposed to Chicano culture – the pocho and calo dialects, wall-ball, and murals. He remembers the strong influence of seeing Blood in, Blood Out. 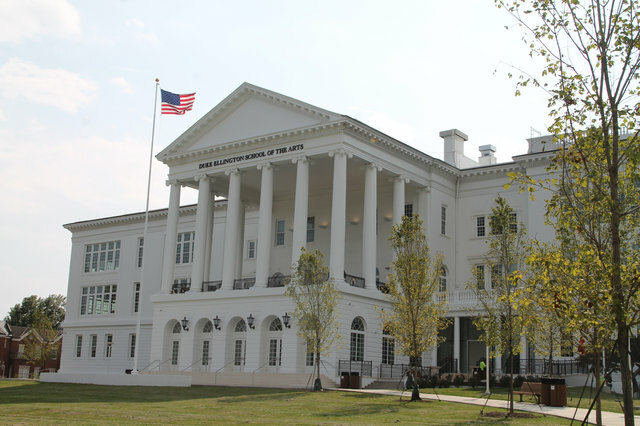 The first year at CCA was deceiving – he was provided with housing, had a scholarship, and had savings from high school. 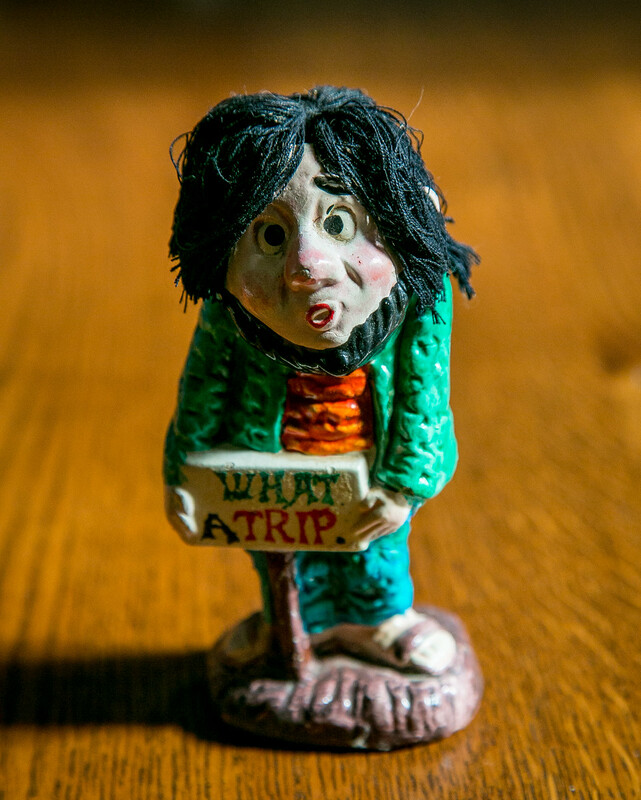 In his sophomore year he juggled jobs and school and his art. He learned to balance paying rent with making his own art. For Perez, print-making is the purest form of expression. 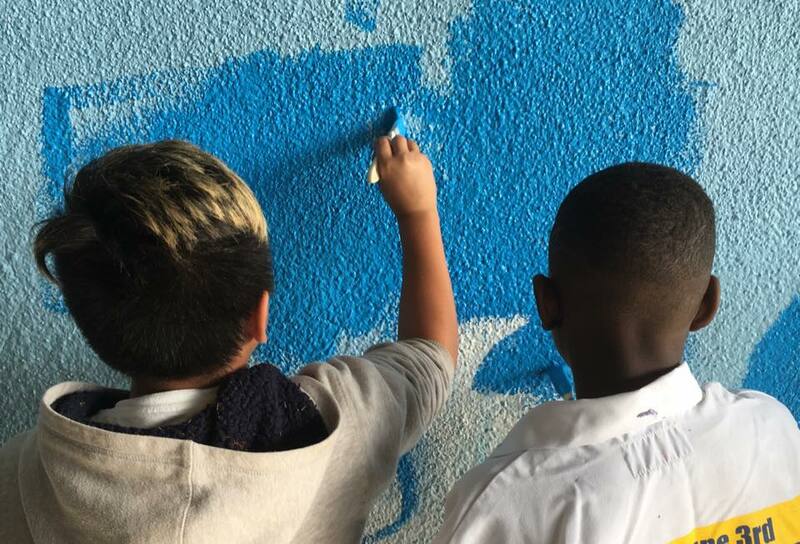 His first mural was at the Realm Charter School. 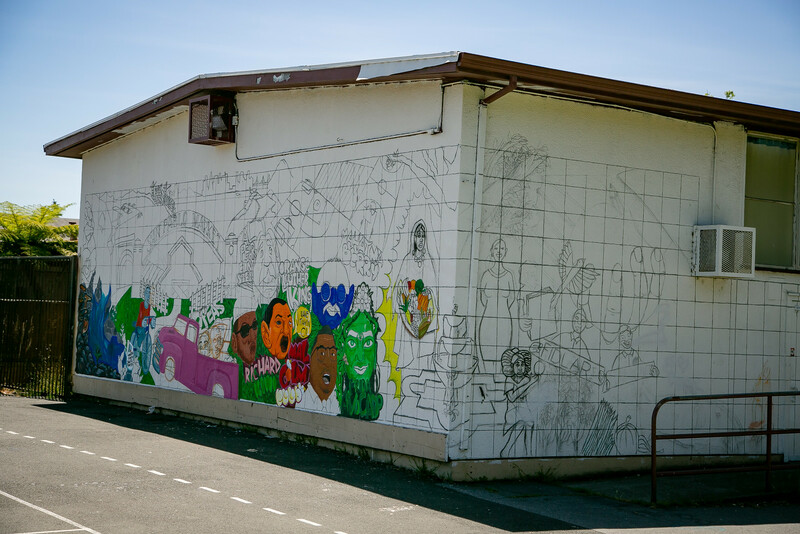 He worked under muralist Juana Alicia in 2013 as part of a mural class she taught at Berkeley Community College. 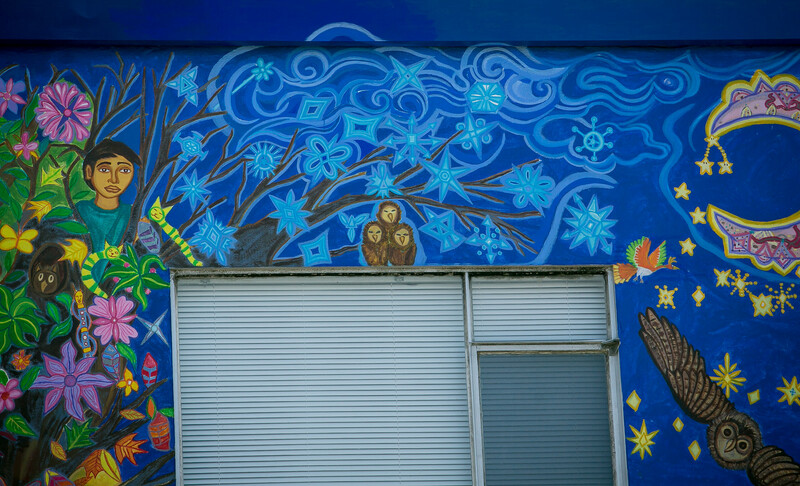 I couldn’t get access to the school to photograph the mural. He made a mural at CCA. The administration rejected his design for a mural. 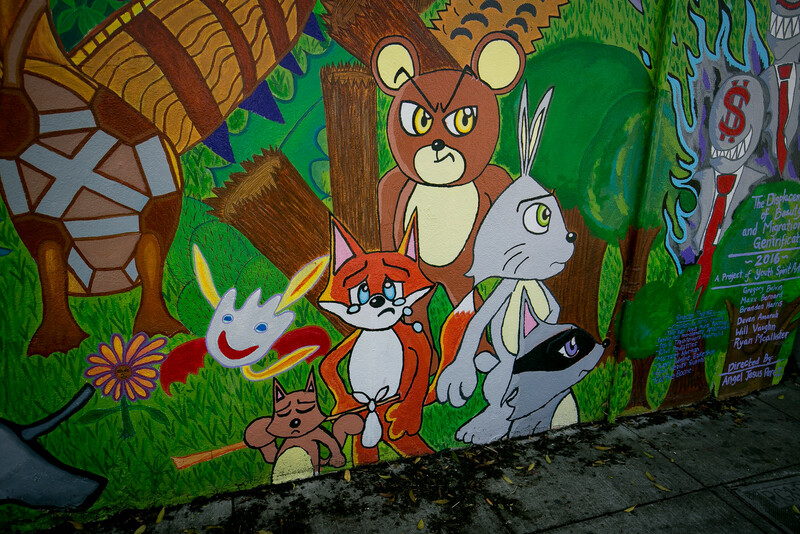 After a white paint accident defaced the existing mural, he was given permission to paint his mural. 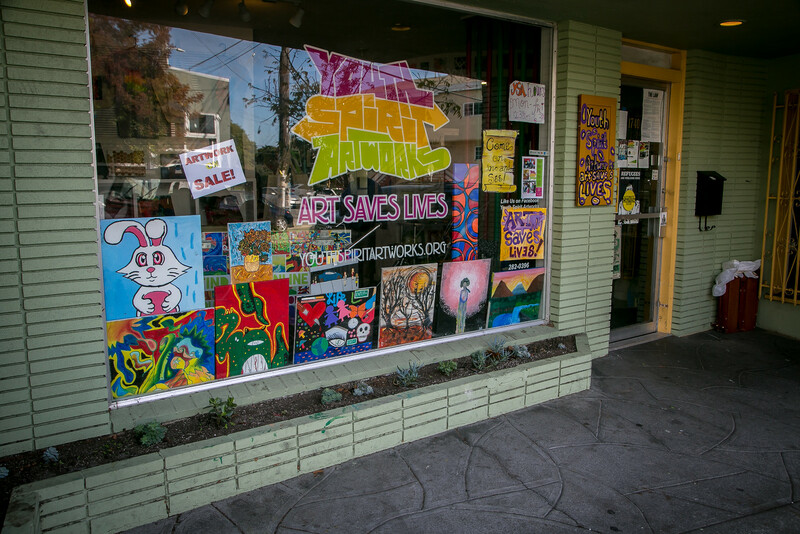 In 2013, Perez went to work for Youth Spirit Artworks. 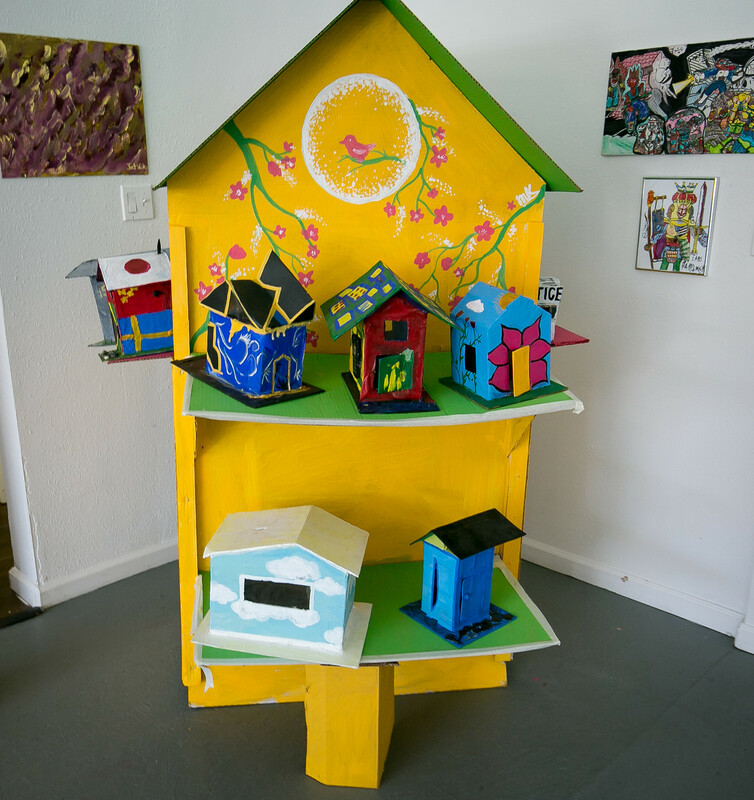 YSA is an art jobs training program that Sally Hindman founded in 2007. She has given her work life to helping the homeless, the least of these our brethren. 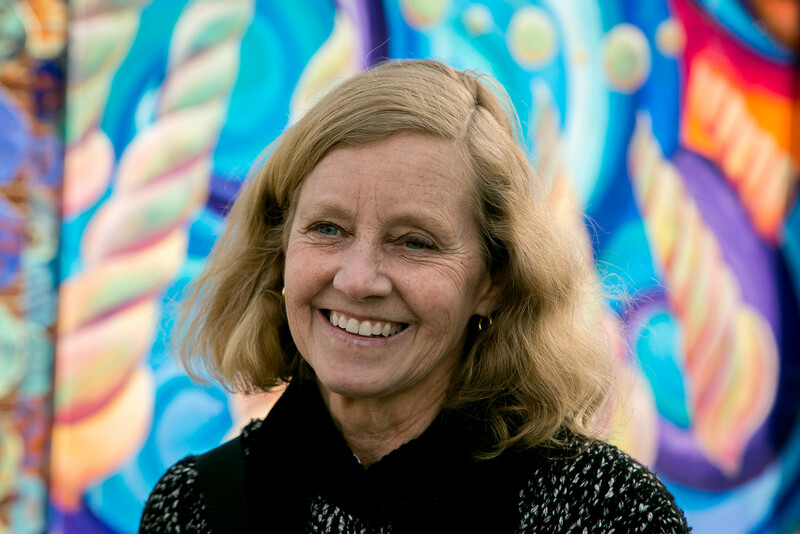 She co-founded Street Spirit, the San Francisco/East Bay street-distributed publication that focuses on issues of homelessness. 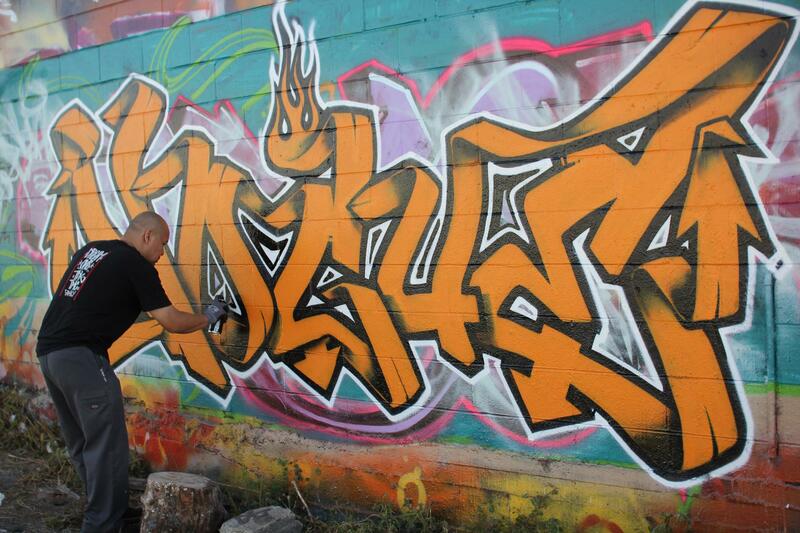 Perez worked in YSA’s day shelter for homeless youth. He says that it was rough and that being a disciplinarian was a big part of the job. The kids would leave the Yeah Shelter in Berkeley in the morning and come to YSA. There they were exposed to art. The most popular art form was poetry. 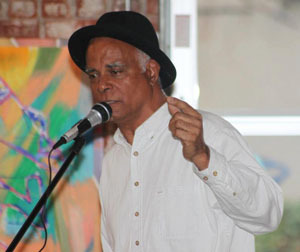 Jazz poetCharles Curtis Blackwell taught the poetry class and reached a number of the kids. 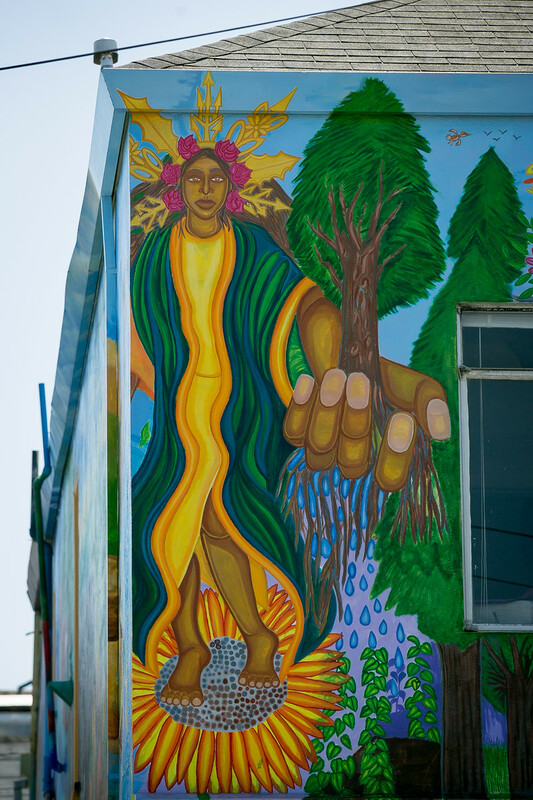 Perez was part of a team including Joaquin Newman that started a mural in Davis Park, San Pablo,financed by the San Pablo Youth Council and Richmond Youth Works. 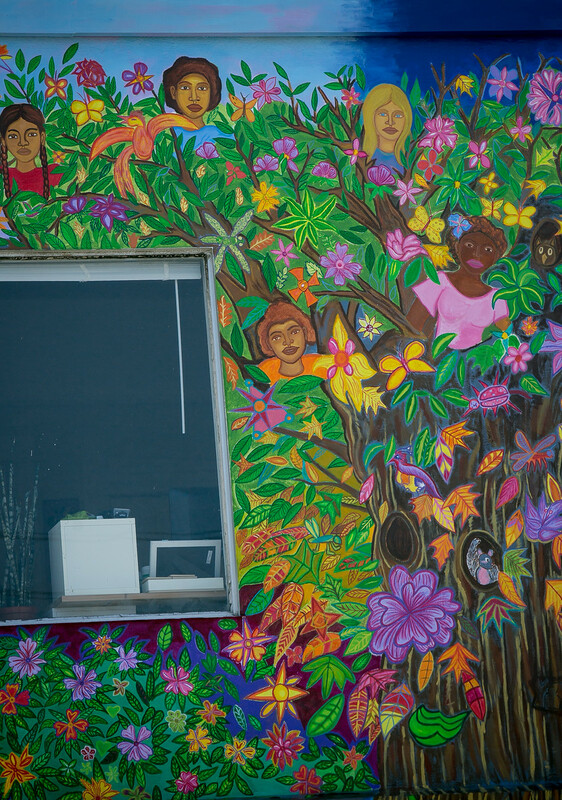 The mural was to celebrate healthy living and eating. 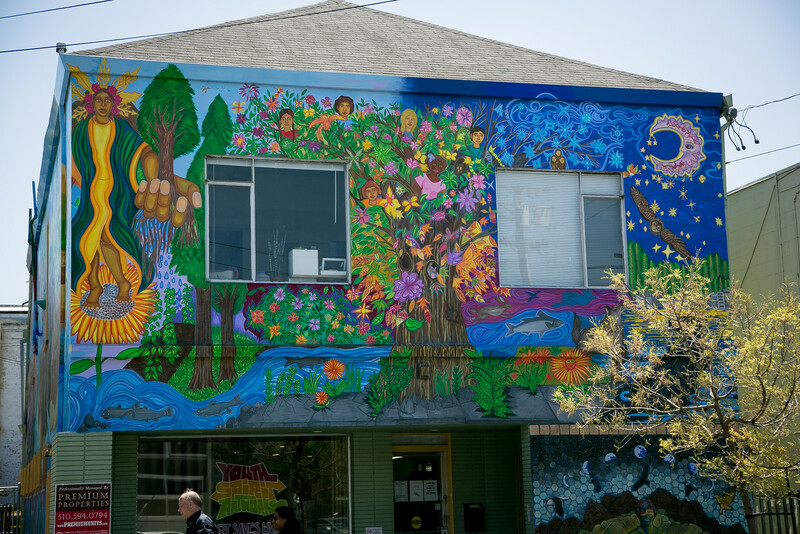 San Pablo was a participant of Kaiser Permanente’s “Healthy Eating, Active Living” initiative, which seeks to promote community health in low-income and park poor areas. 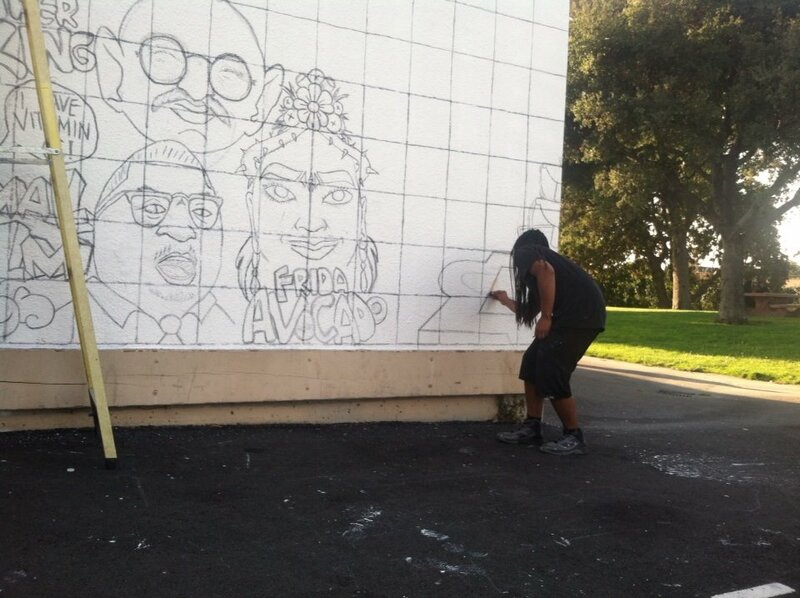 In this photo Perez is working on the design of the San Pablo mural in 2014. Also shown is a co-teacher on the project. Note the grid transfer from the master sketch to the wall. Funding dried up but the bones are there to be completed. One can hope. 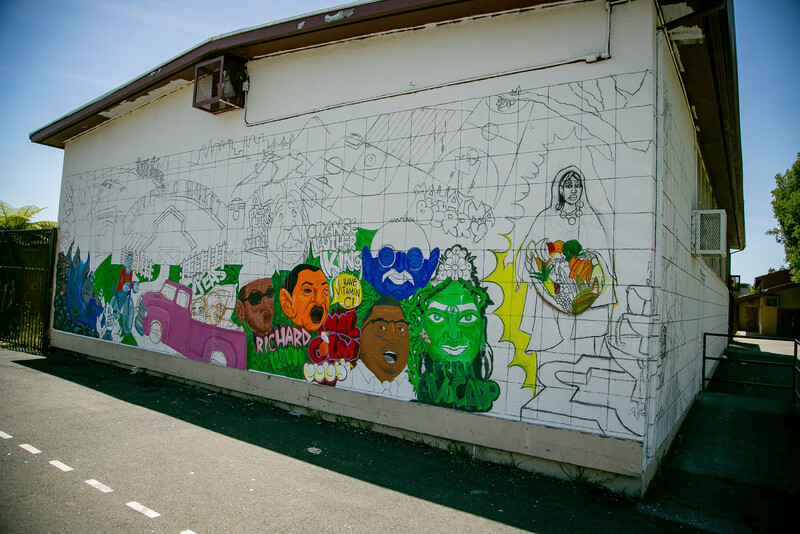 And then there is the Superheroes of Oakland mural that Perez was part of. 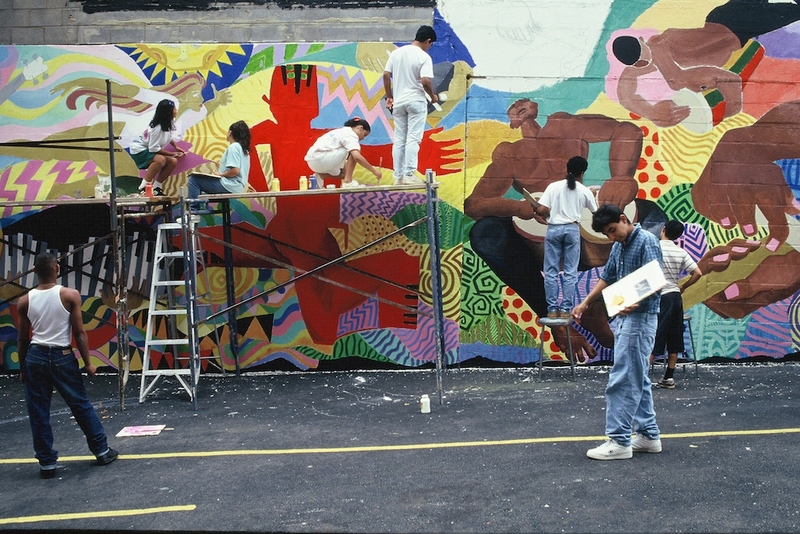 The mural was a project of Attitudinal Healing Connection. 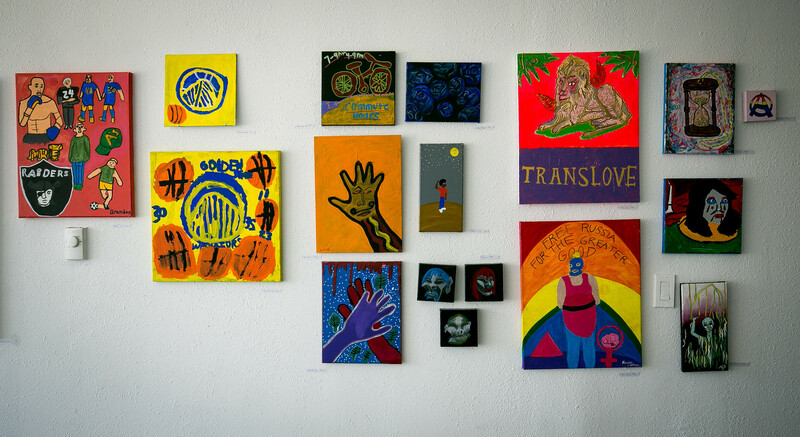 They work to empower individuals through art, creativity and education. 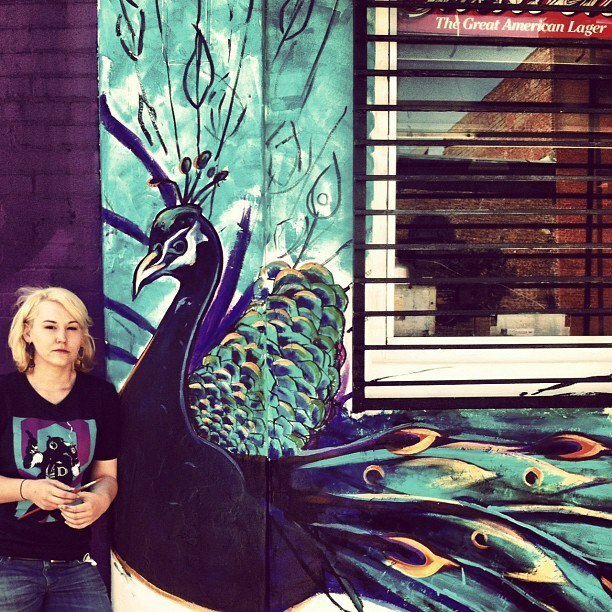 The lead artist on the mural on which Perez worked was Lindsey Mllikan. 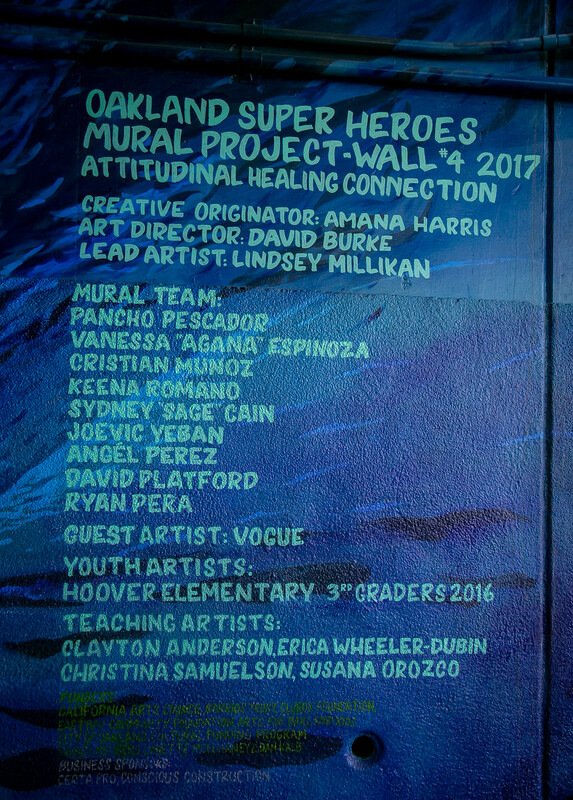 Perez was one of eight artists who worked on the mural. 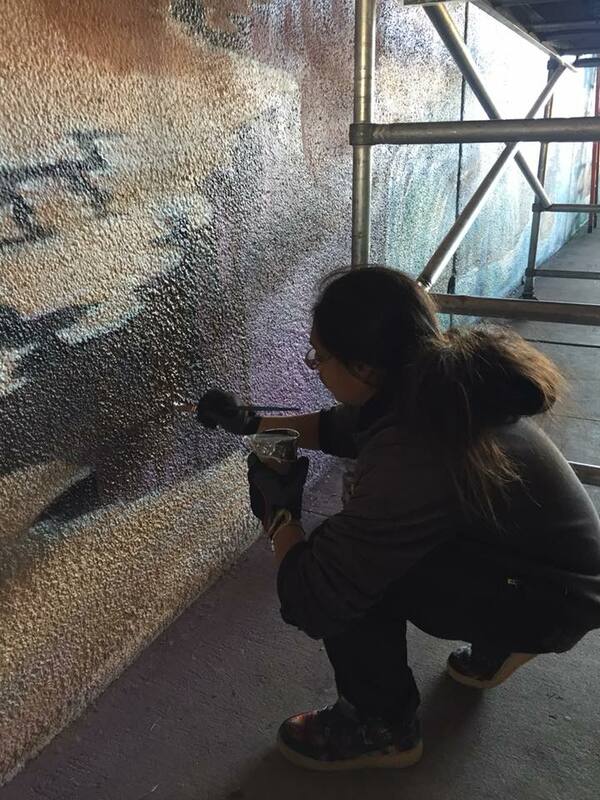 It was his first time painting with other professional muralists instead of students, and it was the first time that he worked with a slide projector instead of a grid transfer. 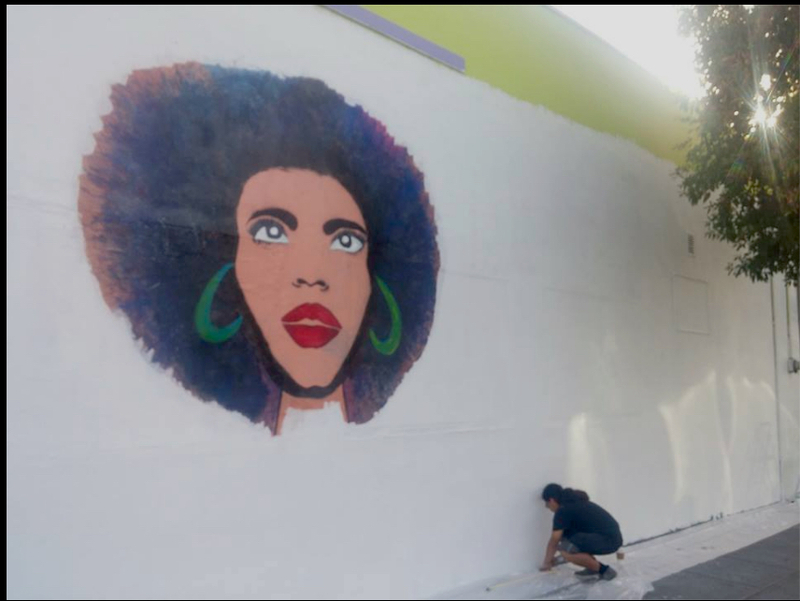 One of the artists, working on the mural across the street from where Angel worked, was Antonio Ramos. 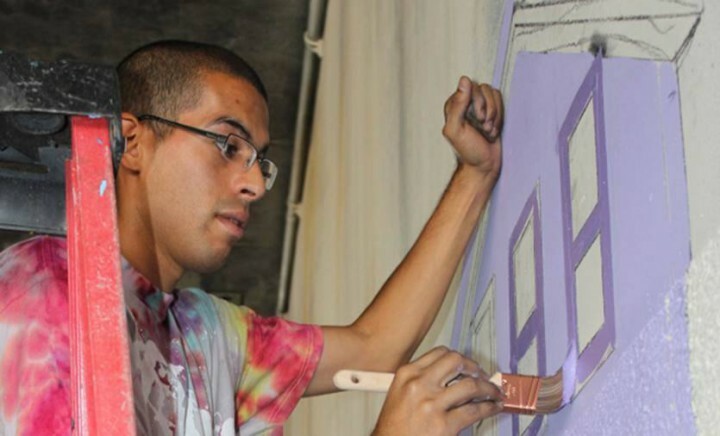 Ramos was murdered on Tuesday, September 29th, 2015 while painting the mural under the 580 freeway in West Street, around 10.30 in the morning. Ramos confronted a man stealing his paints. Another artist on the project was the artist known as Vogue. Vogue is a superhero of mine. 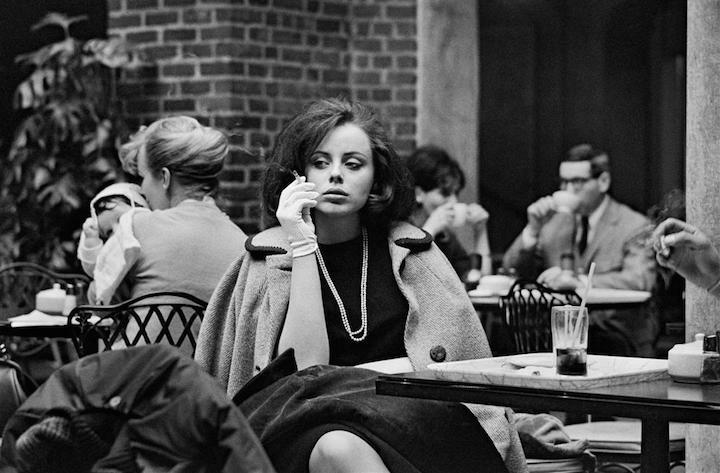 I dream of spending a day with him and John Storey, the Quirky Berkeley Master Photographer. Vogue’s work defies worthy description. I wish I knew someone who could link me up with him or at the very least give me his phone number. And, yes, that is a hint to the universe. There were student artists as well as the professionals. Holy moly. What a mural. As I said earlier, Perez finds his greatest joy in print-making. 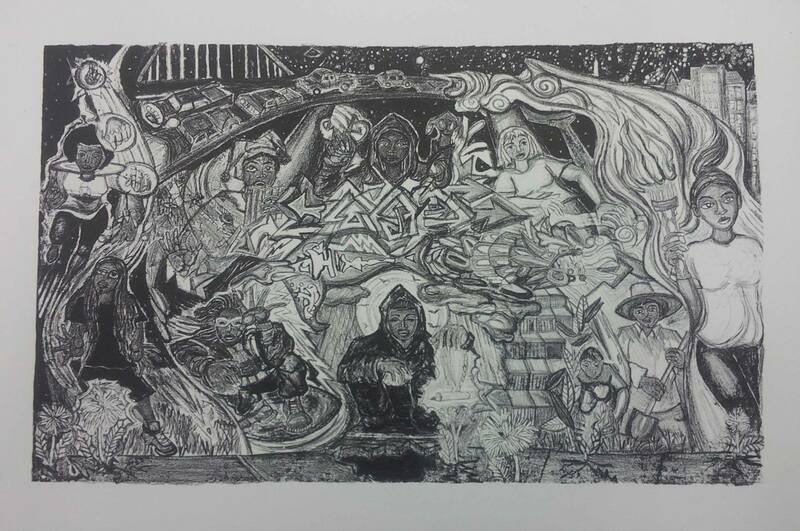 Several of his prints are on view and for sale at the new YSA student gallery at 3308 Adeline. There wasn’t anything in the gallery that I wouldn’t be happy to have. An alley juts south from Alcatraz just east of the YSA office, into a funky courtyard. It is the plan of YSA that there be 20 murals here, along Alcatraz, back south the alley, and on the walls of the courtyard. 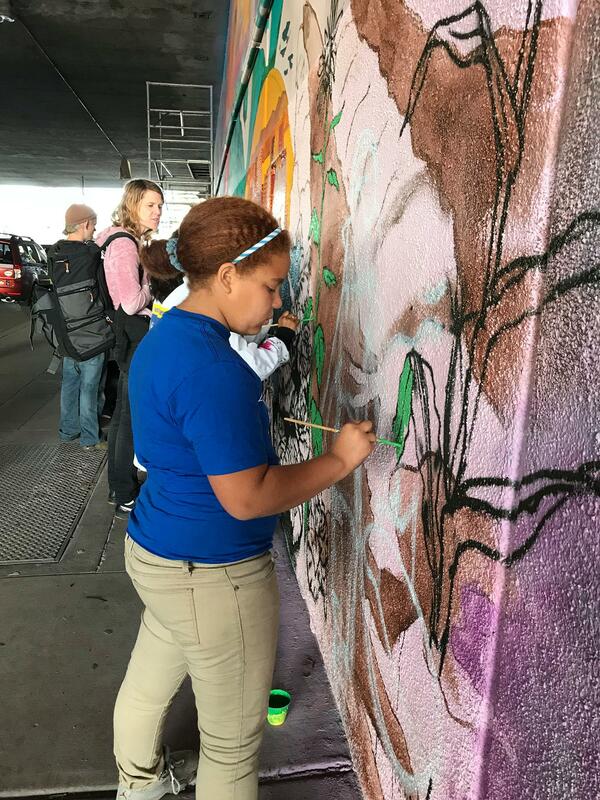 It will be known as the Alcatraz Alley Mural Park. The murals that are finished rock a very quirky mural vibe. 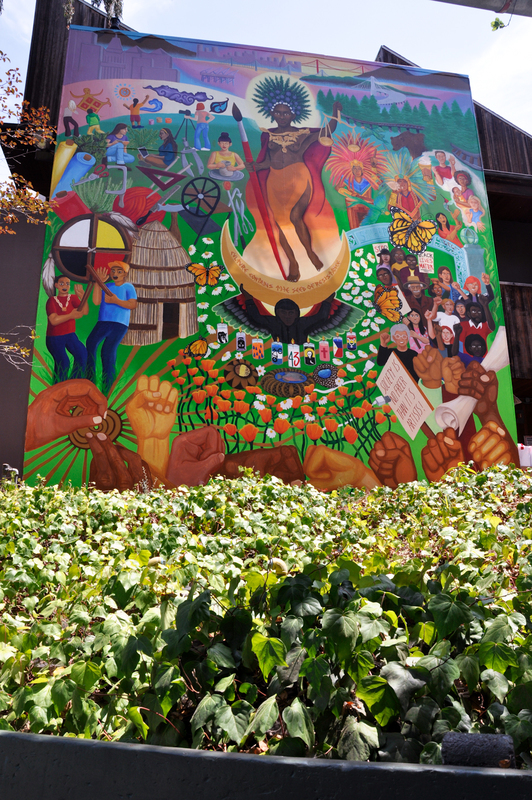 Yes, I know, Berkeley can’t hold a candle to Oakland and San Francisco when it comes to murals. 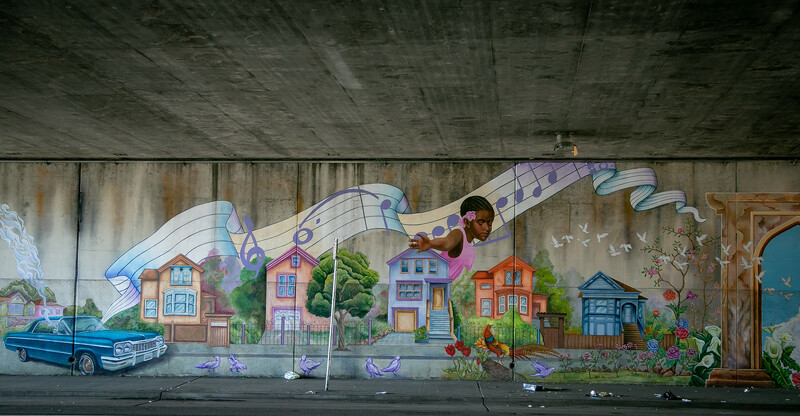 I see no point in feeling inferior or jealous of Oakland or San Francisco and their murals. We are what we are. 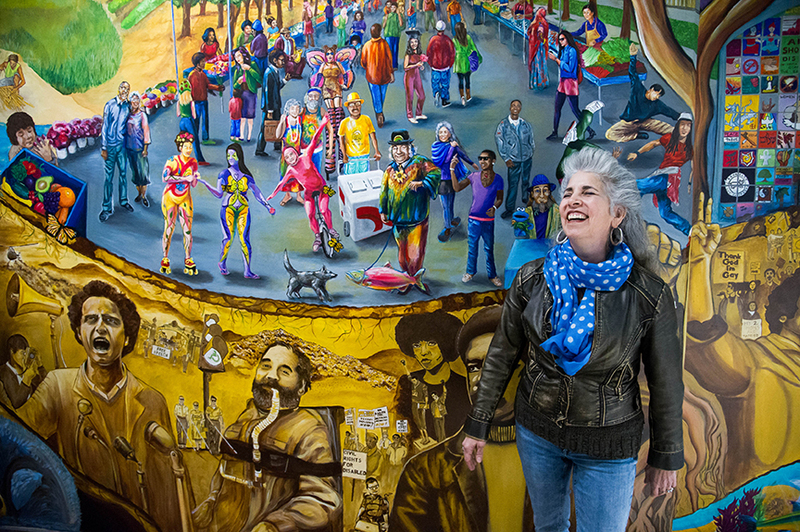 They are great, but we have a proud mural legacy and a spirited mural movement of our own. 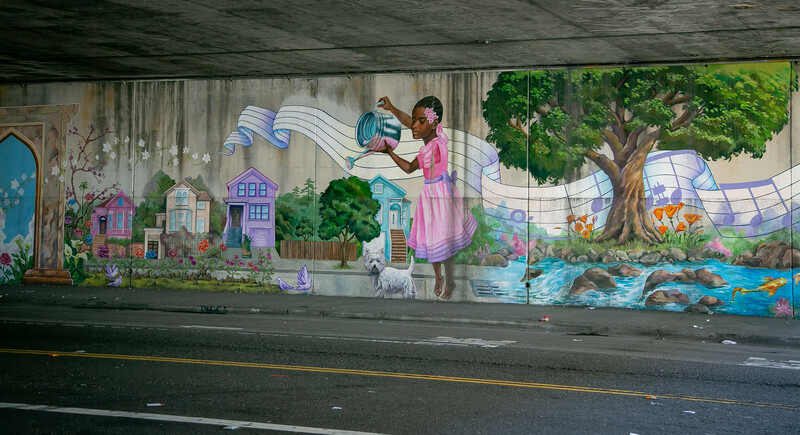 I’ve heard a few ideas for Berkeley murals that thrill me, one in particular. 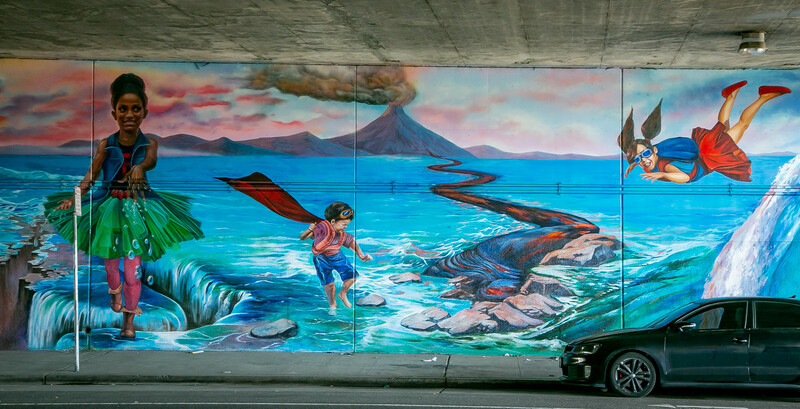 I hope that this mural comes to be, that someone trusts their instinct on it. But back to what this is all about – Angel Jesus Perez. He blends art and street culture and progressive politics and compassion and caring about the poor and at-risk and hard work and dedication. He gets it. We are better for having him with us. I asked my friend about this draft post. He answered by talking about his childhood in Detroit. When he was 14, he started sneaking into strip shows and nudie movies at the Stone and the National and the Empress. 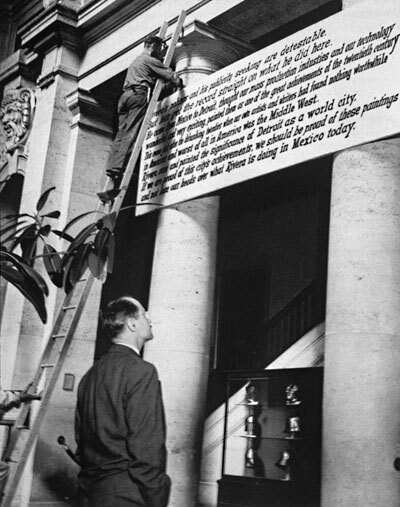 A year later, he discovered the Detroit Institute of Arts. At first, what he discovered were the young women who hung out there and were inclined to flirt with an innocent if scruffy teen boy. Then he discovered the Rivera murals. He’s been all about murals since then. “The Good and Decent People of Detroit were freaked out by Rivera on account of he was a Marxist. God forbid! Lovely digression, but what about Angel Jesus Perez and his work?